With this release, we’ve made updates to the Trails map in the Geocaching® app and the Geocaching map on Geocaching.com. 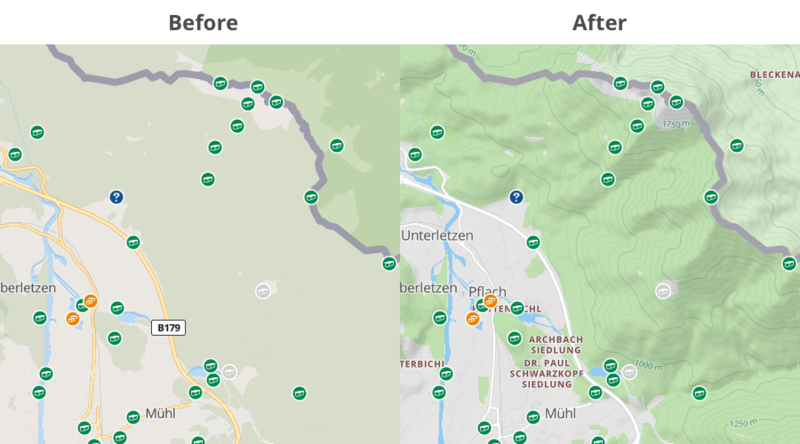 To see the changes on Geocaching.com, go to maps and select Leaflet as your default map system. We added topographic contour lines and hillshading. 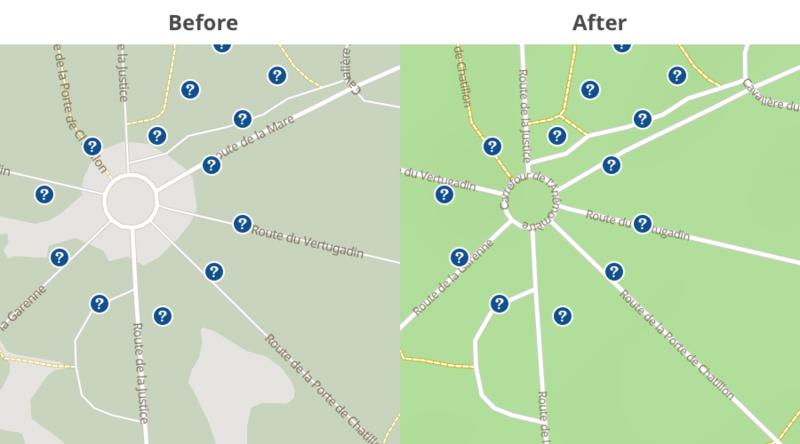 We made additional style changes that reduce the prominence of roads, buildings, and commercial centers. There is now more contrast and focus on trails, parks, and geographic features. 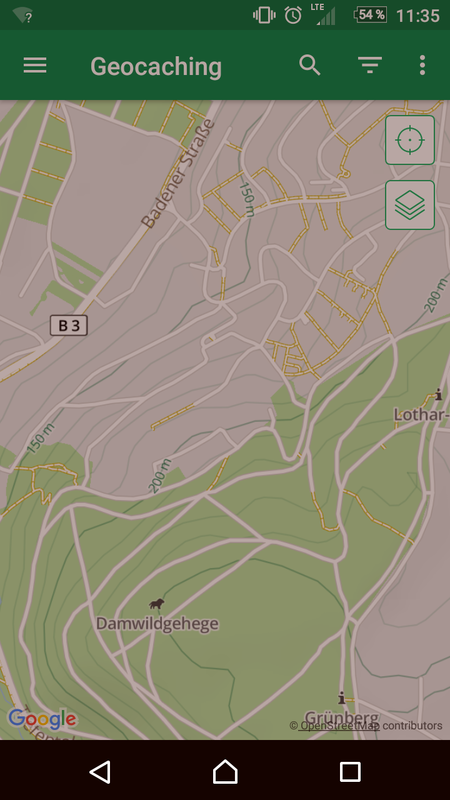 All OpenStreetMap data is updated and will now update every 1-2 months. We fixed an issue where right-to-left languages (e.g. Hebrew and Arabic) were not displayed correctly. Ben F. (Benno) from HQ’s IT Team is watching this thread to answer questions whenever possible. Very nice. I think the trails could be a little more prominent - the yellow blends in with the green quite a lot. I tend to use the Open Cycle map styling most often as the trails really pop out. Other note - is there no way to turn off the auto-cache-load-whenever-you-pan-the-map? That seems to take priority and make map tile loading take longer, plus I may just be wanting to scan around the map, not actually use my data bandwidth to consistently update the visible caches wherever I stop for a second or two (which also clears the previous visible caches). Am I missing a setting somewhere? Although the "Use metric system" setting on my mobile app is turned off, I notice that the contour lines are still labeled in meters. Any way of switching contour labels to imperial system? Great! It's nice to finally see the data updated and for there to be a plan to keep it updated. It isn't right up-to-date now, though. Judging by what is and isn't shown, it looks like the data dates from late February, so it might already be time for another update. Sadly, it appears that none of the bugs or style suggestions from my original post in 2016 or my more recent post in March have been fixed or implemented. That's unfortunate, because while the new style is definitely an improvement, there are many ways in which it could be made much better. On the whole it looks good, but one annoying thing for me is that, although the maps show railway lines, they don't show the stations. Caching by train can be a good option, particularly in large cities with an extensive rail network, but it makes it hard if you don't know where the stations are. I like the new topo maps! But meters do not mean anything to me! Yes. I have worked in export packaging or over thirty years. But meters do NOT mean anything to me. I need feet! The new trails is great! But there are a lot of major trails not on the map. I have several caches along the Four Birds Trail. Trail not on the map. Nice addition to the maps, but many major things are missing. Trail not on the map. 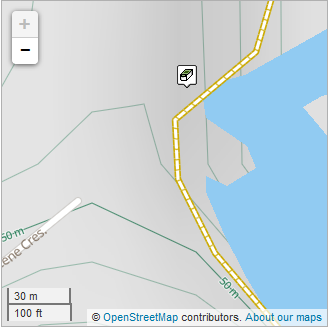 You can add the trail to the map, if you have a GPS track log or can see it from space. Or send me the GPX and I'll add it (limited time offer). OSM is the best trail map going, and getting better. But virtually all topo maps that offer international coverage show contours in meters (metres) only, because that's what most countries use, and maintaining two sets of map tiles requires twice the space & computation. I'm not aware of any dual-system offering. EDIT: Just noticed Groundspeak offers Esri WorldTopoMap which does show feet in USA, metres in Canada and likely elsewhere. But it won't rock for trails like OSM does. This map can't be everything for everyone, but it is an improvement. For me there used to be a "Filter" box on the search landing page here https://www.geocaching.com/play/search which is nolonger there. It's now required to add a location, do a search, then change the filters. Please put the Filter box back on the search landing page, as it was very useful to be able to search with filters without specifying a location. Great changes, however the map doesn't differentiate between tracks and roads (see below). Whilst this is no issue for people driving a 4x4 or similar, all the others can't use the map to know where they can drive through and where not. Similar goes for those caching by bike. Whilst fixing this it would be nice to directly include the grade information from the osm data data. Cool to see you continuing to update. Not 100% sure I like the contour lines-- I mean, I didn't always want to know just how steep that climb was going to be! I'm sure I'll get used to it, but initially, it seems a tad harder to read. Maybe the contours are adding some "business" to things. But, I'm going to give it a shot. I appreciate all the work all of you do to keep making progress! Out of curiosity, I took a look at how the new map would show the cache I recently archived due to the dangers of the latest app version trying to entice people to climb down a vertical cliff, wondering if the contour lines might have made the cliff more obvious, but no, instead it shows the sea as well as the cache as being between 30 and 40 metres above sea level. I suspect these contours won't be of much help around here where cliffs are more the norm than gently rolling hills. Incidently, the yellow track shown on the map doesn't exist either. but no, instead it shows the sea as well as the cache as being between 30 and 40 metres above sea level. Hey, that's quite a trick! This page explains the quality issues with the elevation data (used for contour lines) in a few parts of the world, unfortunately including yours. That site may actually be the (filtered) source used for these maps. In my own region (western Alberta), it mentions problems with the default data source, and that they switch to a better source specifically there. 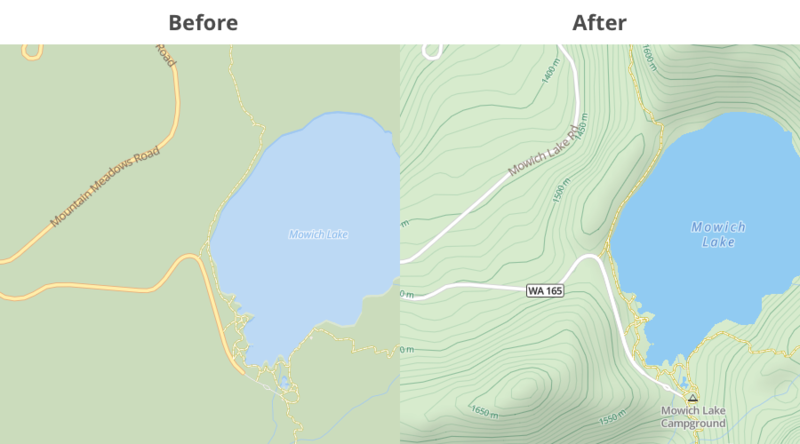 In my map-cruising, I can definitely tell which maps used the good source (SRTM) and which used the bad one (old gov't data.) But it's nice to have someone going through the data sources, picking out the best, and making it all publicly available as a remix. PS, in my experience, cliffs seem to disappear on all maps, not just this one, unless they're marked specifically by the mapper. Probably has to do with the difficulty of measuring altitude from space, possibly at an angle. But that's just a guess. 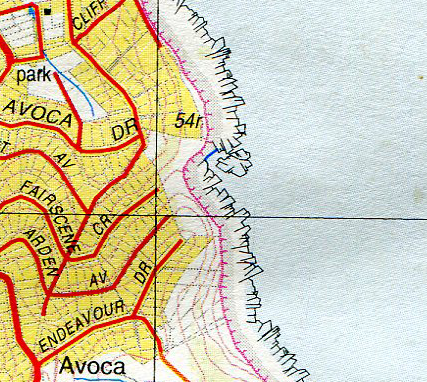 The good old-fashioned paper topographic maps had no trouble showing them . I checked, the cliffs are not marked on OSM. If you insert them, they will appear in the Thunderforest Landscape map. However the Geocaching map does not include cliffs, so @Geocaching HQ, please add those, since they are an important feature, as seen in @barefootjeff case.